Since its formation in 2012, Hurst Media Company has grown from a small, independent publisher to a contract publisher who works with some of the biggest names in media including The Guardian, The Telegraph and OK! magazine. Its flagship title is Celebrity Secrets – a celebrity-themed women’s lifestyle title which is distributed in OK! magazine bumper packs. Celebrity Secrets covers a range of different editorial themes including family, Christmas, New Year, weddings, travel and health. Its inaugural issue, Family Life with Billie Faiers, was published in September 2017 and is an exciting addition to the Hurst Media portfolio. Other titles which Hurst Media Company regularly publish include The Countryside Experience and Arts, Antiques & Collectibles both of which are distributed with The Telegraph. These titles have attracted leading advertising partners such as Bonhams, James Purdey and Swarovski who have seen the value in these themed newspaper publications. Hurst Media Company also launched the mature men’s lifestyle magazine, CALIBRE, which was published between 2013 and 2017 before being sold to International Media in 2017. During those four highly-successful years, CALIBRE grew from a quarterly title to a bi-monthly one, launched an annual luxury title and affirmed its position as the leading lifestyle magazine for the mature, modern man. A wide range of celebrity talent has been attracted to the titles which Hurst Media Company has published. Stars such as James May, Sir Ben Kingsley, Brian Blessed, John Lydon, Ben Fogle and Billie Faiers have all featured within Hurst Media publications alongside many more. To provide second to none customer service, innovative products and value for money to our clients. To provide ourselves with secure jobs, working in a stimulating and equal opportunities environment. To be profitable to ensure our long-term growth and survival. EXCLUSIVE INTERVIEW WITH KERRY KATONA INSIDE CELEBRITY SECRETS: THE SPRING ISSUE OUT NOW! 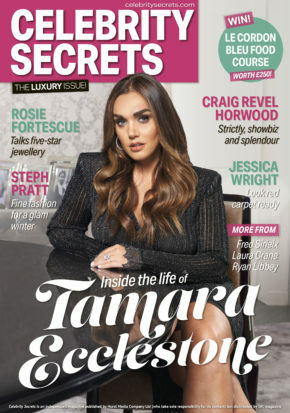 Exlusive interview with Tamara Ecclestone inside Celebrity Secrets Luxury Issue out now!